^ a b “将棋の起源”. 朝日現代用語 知恵蔵2006. 朝日新聞社. (2006年1月1日). pp. 999-1000. ISBN 4-02-390006-0. ^ 将棋について-本将棋［5.反則］：日本将棋連盟 Archived 2014年9月26日, at the Wayback Machine. ^ Roger Hare (2019). 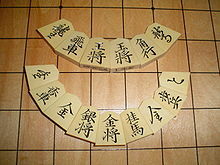 A Brief Introduction to Shogi. http://eric.macshogi.com/shogi/roger/Introduction%20to%20Shogi.pdf. ^ a b Yen, Chen, Yang, Hsu (2004) "Computer Chinese Chess"